The process of tethering allows you to connect your computer to the internet via your phone's 3G mobile connection. This is a life saver if you are working in a location where you don't have access to other internet connections. Broadly speaking, there are two methods of tethering: plugging the phone directly into your computer via USB, or setting up the phone as a mini Wi-Fi hotspot. I prefer to plug in directly because Wi-Fi uses up battery power on the phone (and the laptop if unplugged) very quickly. Unfortunately, I have an Android phone and a Mac computer. The official Android website says that you can use a USB cable for tethering with computers running Windows or Linux but not with Mac OS X. Nevertheless I have found a way to do it with OS X, read on for more information. Warning: Always check your network tariff before doing this. You could be charged extra by your phone network if internet data is not included in your mobile price plan. LG Optimus One (LG-P500) running Android 2.2 (FroYo) on the Three UK network. Apple MacBook Pro running Mac OS X Snow Leopard (10.6.5). Setting your phone to act as a WiFi hotspot - Works with all WiFi-enabled computers regardless of OS but slower than USB and a massive waste of battery power. Other ways of USB tethering – Officially supported on Windows and Linux but not OS X.
Connect your phone to the Mac with USB cable (mine works regardless of whether USB storage or USB tethering is selected in Android, although other phones could be different). Go to Network Preferences in OS X (Apple Menu > System Preferences... > Network). If it hasn't been added automatically, click the “+” button to add a new network interface. Select “LG Android USB Device”. Click OK, then Apply, then Connect and hopefully you'll be able to connect to the internet via your mobile network. Note: ticking "Show modem status in menu bar" is very useful if you're using this feature a lot. 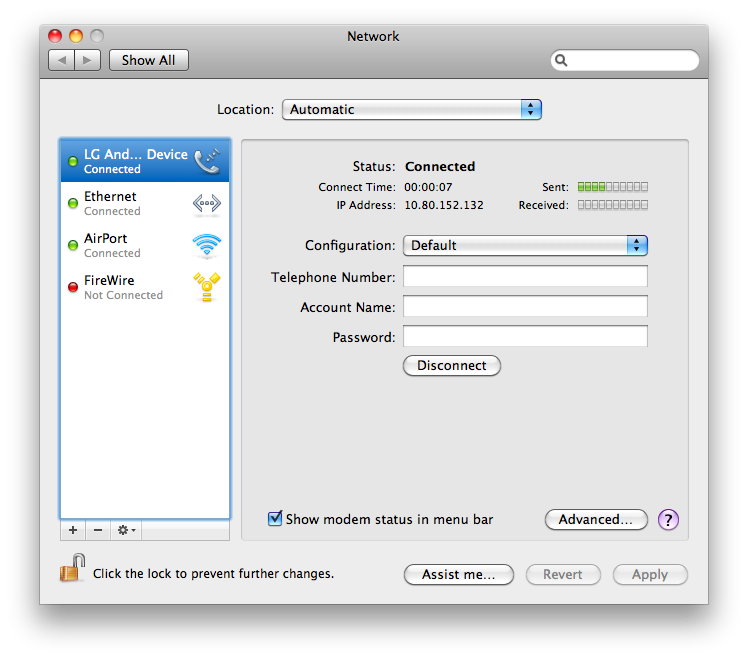 I used to USB-tether my Mac with my old Skypephone S2 on the Three UK network. I found out how to do it by following this article. The article itself only explains how to do this in Windows but one of the comments gives instructions for how to do it on a Mac. I tried your solution, but it's not my luck, doesn't work. I already enable USB tethering in 'Wireless & networks', and choose USB tethering in USB connection type. Is there any other turn around solution ? 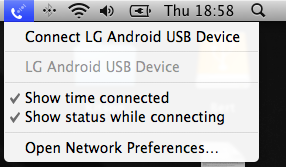 I've recently discovered one thing that stops OS X USB tethering from working with Android. For a while it was really unreliable for me, sometimes it would work and sometimes it wouldn't. I've found that it was because I had an app called Juice Defender installed on my phone. This app is very good at saving battery life but it does so by switching your phone's data mode off and on according to a set of rules that you specify. I found that when I uninstalled Juice Defender it was no longer controlling the way my phone connected to the network and therefore Android was able to tether with OS X more reliably. Obviously this will only be of any use to you if you happen to have Juice Defender installed. Apart from this discovery I'm sorry to say I can't think of anything else to suggest. Your advice on tethering worked for me on my HTC Wildfire connected via T-Mobile. Thanks. LGP500 Optimus works with OS-X! Thanks a lot! Your solution worked fine for my LGP500 and OS-X 10.6.6. Thanks for this post. Helped me a lot! But in addition, I had to enter my phnoe number to get it work. thanks for sharing this. it is working with LG Optimus ME and OS X 10.6.8. Works for Samsung Galaxy Ace, too! 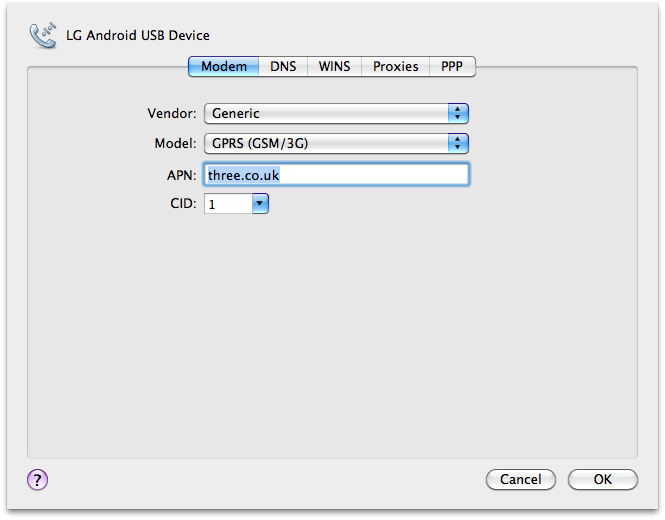 The exact same steps work for a Samsung Galaxy Ace, running Android 2.3.3, with OSX 10.6.8 on the Italian Wind network. I tried quite a lot of combinations of similar settings in the past, with no success. Maybe I was misled by the availability of the "Samsung" vendor in the modem options, but it works with the "Generic" setting instead. I do not need to enable USB tethering on the phone, either. Is there any way for usb thetering with my G1 without install another useless app like you did? Works perfectly but connection network comes up as ethernet rather than Android phone. Not sure why but don't really care! Tethering was working for me (with Mac OS x) for ages but suddenly stopped. Thanks for bringing it back to me! Great thanks for this I kept missing a step and was frustrated it wasn't working with my Samsung. Been trying to get this working for a few years. Finally working now. Enabled USB Debugging, but NOT USB Tethering. When I first got my Android phone, Evo 4G, "Android Phone" was available as an interface in the Network control panel. I'm pretty sure that I deleted it at one point, because I couldn't get it to do anything. Not it's still gone and I want it back! When I click + there is no option for the droid in the Interface menu. Anyone know how to get that back? I never installed it in the first place, it must have loaded from the phone. But now that I've deleted it it must be remembering that and not adding it again. when i follow instructions to find the APN, I find the apn screen but there are no names or addresses listed. Help please. After many, many false starts I followed these instructions properly and they worked. * *Don't* check the USB tethering on the Android device; just connect the cable (and enter the password on the phone). * Look up the APN as instructed above: in my case it was mobile.o2.co.uk (not 02.co.uk as I had initially assumed). Thanks. I was searching from many days finally i got it worked. Select samsung then 3g/Gsm and enter your APN(can be found under Access Point Name of mobile network setting). and in mobile Do not select any Tethering option. Uncheck both USB tethering and Mobile Ap(Go to Tethering Option and uncheck both) otherwise it won't work. Then Save and try to connect. Hope it will helpful too. Great! It worked for me on OSX 10.8.2 and the good old lg P500.. thank you very much! Big thanks to your post. Once I had everything configured, it worked seamlessly. Thanks for sharing this article with us. I searched many days finally, I got it from this article.This information is very helpful and solved that problem. Nice.